Hello and welcome awesome Crafters! back to share a DT project for the Dies R Us Inspirational Blog. 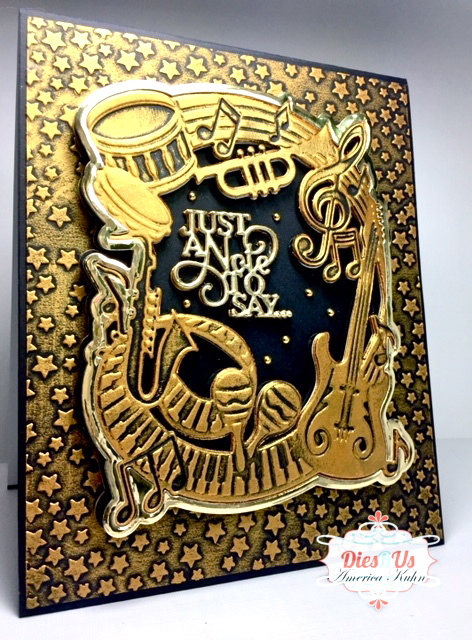 I've used a terrific Musical Die by Sue Wilson that is fabulously detailed and makes it easy to create fun, fast cards! 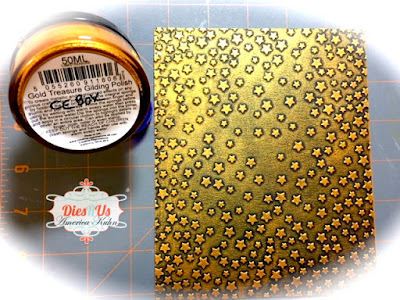 Creative Expressions Gold Treasure Gilding Polish, Creative Expressions Gold Mirrored Cardstock, Coconut White Foundations Card, Black Cardstock, Gold Flat-back Gems. Start by using a coloring medium (such as a Gilding Polish), to sponge over the raised dry-embossed background panel. I've used black Cardstock paper and polished it with a gold gilding polish for contrast. Dark papers with metallic mediums show-off the embossing details best. Next, I diecut 2 extra back panels and sponged edges with same gilding polish, as well as several of the sentiments to adhere together and layer. 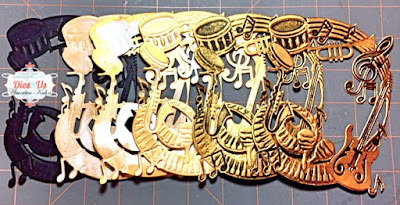 I also die-cut several of the musical panels to layer-up and give the focal point great dimension. The last diecut was made to frame the main panel and finish the look. This thin frame was diecut from Gold Mirrored Cardstock by using both framing dies together and running through diecut machine once. The result is a fabulous golden border to go around the detailed musical panel! 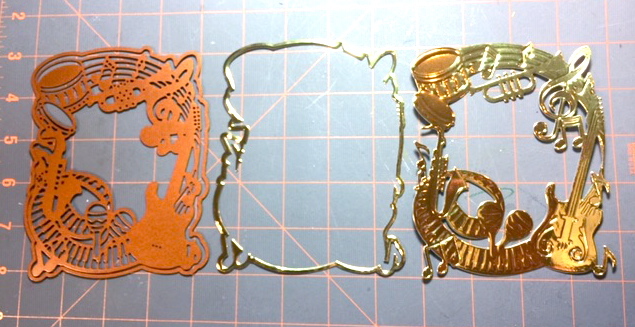 At this point, I also decided to diecut an additional sentiment from the same Gold Mirrored Cardstock to match.. The last step was adding the gold gems. 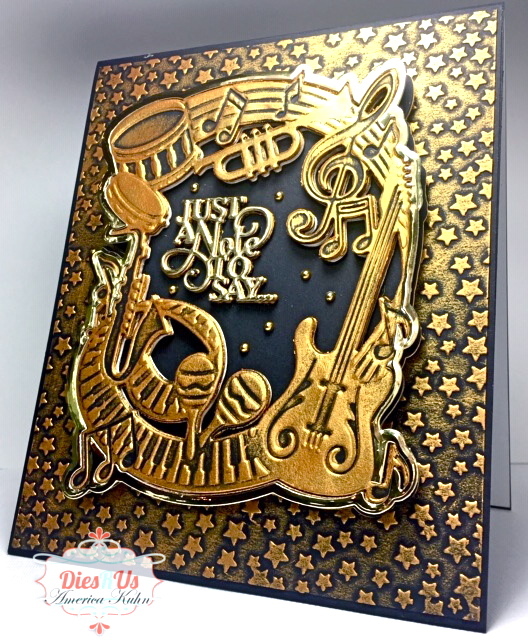 End result is a shimmery golden musical card with lots of fun texture. That's it! 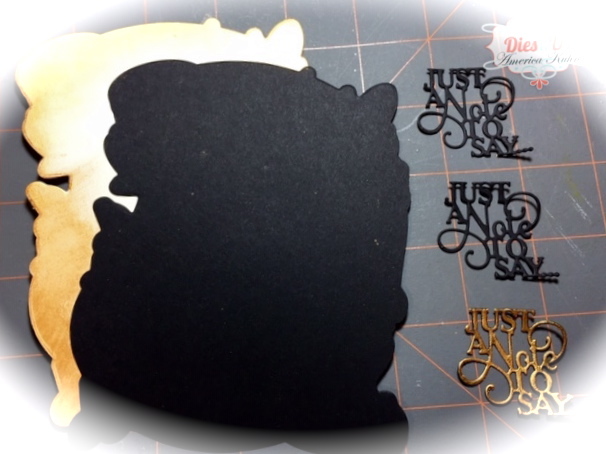 Hope you'll give this Sue Wilson cutting die a try! ARE YOU a Sue Wilson FAN? 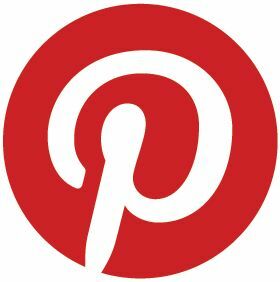 Then hurry to check out a fantastic inspiring FB group where SW fans like you interact, share ideas, tips, tricks, tutorials, and fabulous makes using Sue's amazing products! Click here to go directly there and join the FUN! Fabulous card! Thank you for sharing with us over here at Morgan's Artworld Open Challenge and best of luck with your entry. Love to see you join in each month. Thank you. Well what a beauty. Love love love those die cuts and the gold with black. Looks brilliant. Great work here. Always a pleasure to stop by your blog and view your gorgeous projects. Back again, and again, just gorgeous work here. This is fabulous, thanks for sharing with us over at challenge over at Bleeding Art. Beautiful!!! Thank you for sharing your card with us at Crafts Galore Encore December Challenge. DT Monika. WOW. Beautiful card. Glad you joined us at Morgan's Artworld Open Challenge. Love to see you join in each month. Thank you. Beautiful creation, love the color combo and design! Thank you for sharing with us over at The Creative Crafters. We hope to see you again. 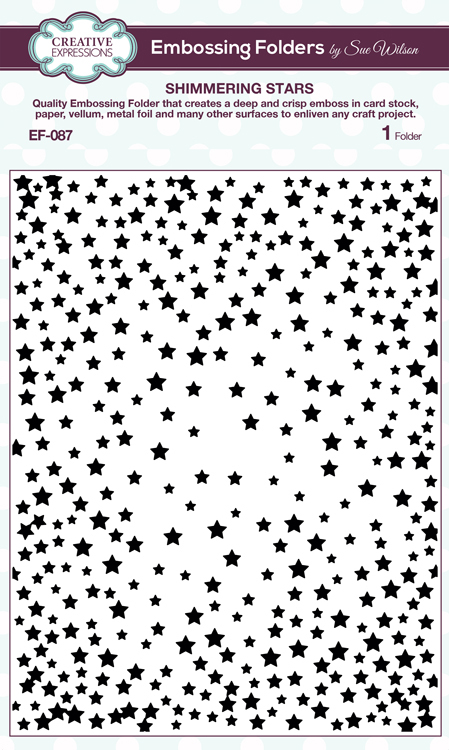 Lovely work, Thank you for Joining us at Happy Little stampers and waiting to see next time. This is a stunning card. Thanks for sharing and participating in the challenge at Love to Craft Challenge Blog. 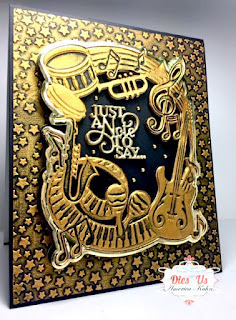 Absolutely stunning card!Thank you for sharing with us at the Crafty Gals Corner!Hope you join us again soon! A gorgeous card and so shiny & bright! Thanks for joining us at Bleeding Art! Thank you for sharing with us over here at World Wide Open Design Team Challenge and best of luck with your entry.